“With a lot of chairs and desks, you can change position, but you do it only when you feel pain,” says Simon Hong, creator of the StandX. When you first meet Simon Hong, and he explains that he makes robotic chairs, you may have a number of reactions. You mean wheelchairs? Dinner table chairs that can eject ill-mannered guests? But Sullivan, it turns out, was the perfect first customer for the robotic chair: the Milford resident had undergone surgery for a herniated disc, and sitting at his desk for long periods could have extreme consequences. Hong’s chair, originally conceived in 2011 to help him address his own back pain, nudges the occupant to shift position every minute or two. 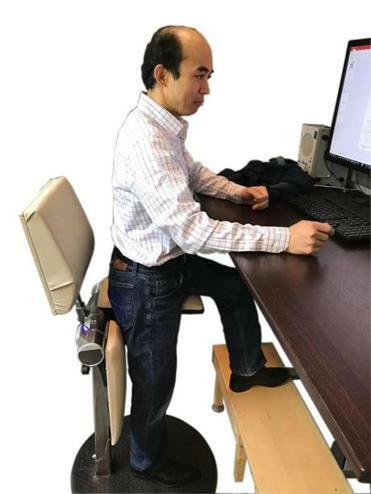 For many early testers of the chair, known as StandX, that regular reminder to cycle through different positions makes long stretches in front of a computer tolerable. We’re living through a kind of Cambrian explosion for office furniture: While a simple rolling chair, file cabinet, and flat surface used to keep workers content, a tour of modern-day workplaces finds workers crafting software code as they walk on treadmills or sit on chairs with an inflated yoga ball for a seat. There are adjustable-height desks and new types of stools that encourage partial standing, or “perching.” There are conference tables that can be converted to Ping-Pong tables, and a whole range of squishy, bean bag-like seats made by Yogibo. So the moment may be right for StandX, the robotic chair that Hong hopes to sell for about $850. Hong began thinking about a chair that would subtly encourage its occupant to move regularly — and he was surprised that there wasn’t anything already on the market. He built a first prototype of the StandX (originally dubbed the ChairBot) in 2011, and quickly applied for a patent. The padded seat of the StandX is split down the center, and each half can either be parallel to the ground like a traditional chair, or perpendicular to it. The chair has a timer you can set — Hong keeps his at about 90 seconds or two minutes. When the timer’s up, the chair gently vibrates to tell you it’s time to switch to a different position. Hong has set up a company to market the chair, Robilis, and he has built 15 early models. (Six of those have sold, for about $1,500 each.) But it has been a nights-and-weekends project, since he still has a full-time job at MIT. “Each chair took about one month to build,” Hong says. “After I finished my daily work at MIT, I would have dinner at home, and then go to Artisan’s Asylum,” a “makerspace” in Somerville that is outfitted with shared fabrication equipment. He’d often stay there working on his chairs until 2 or 3 in the morning. Hong is at one of those entrepreneurial junctures where there are several different paths, and no clear sign of which one is right. Is it to raise money from venture capitalists — which Hong is trying to do — and work on bringing the price of the chair down and then finding eager customers? Is it to take the patent and try to license it to an established furniture company, as Boston venture capitalist Woody Benson suggests? And when is the right moment for Hong to leave his stable employment for the unpredictability of startup life? Louis Goldish, an adviser at MIT’s Venture Mentoring Service who works with campus entrepreneurs, says “the biggest decision he has to make is when to leave his job.” (Goldish, who owns several $400 Varidesk adjustable desk systems, says he tried the StandX, loved it, but didn’t feel it was worth $1,500 to him). Hong says he recently signed on an interim CEO for the company, acknowledging that he is more engineer than businessperson. Once it does, he says there are other product designs already in the works for Robilis.